If that’s your answer to queries about where your elderly mother lives, you and your mom are part of one solution for the looming problem of how to care for America’s rapidly aging population, which is growing at the rate of some 1.7 million seniors each year. Maybe your mother lives in a portable self-contained medical cottage in your backyard. 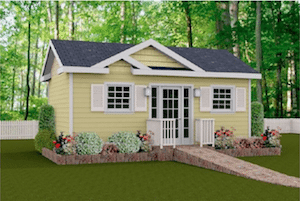 Dubbed “Granny Pods,” these pre-fabricated and pre-equipped medical cottages can be installed in a backyard behind a caregiver’s home, zoning laws permitting, and hooked up to the existing sewer, water and power lines. Though some critics see granny pods as little more than storage containers for the elderly, over time these increasingly sophisticated medical cottages have become viewed as viable alternatives to expensive long-term care facilities, one that keeps aging seniors close to families while offering supervision and care when needed, along with the independence seniors desire. The prototype “granny pod” units cost up to $125,000 installed, have standard safety features like hand railings, defibrillators and first aid supplies, lighted floorboards and a soft floor to minimize damage from falls. The high tech units are also equipped with interactive video and devices that monitor vital signs, like blood pressure and blood glucose, and transmit real time readings to caregivers and physicians. Cameras at floor level and sensors alert caregivers to a fall, the toilet seat records weight and temperature, a hammock-like chair lift transports a resident from bed-to-bathroom, and a computer reminds residents when it is time to take medications. As the story goes, after visiting a depressed parishioner whose family had moved her to a nursing home, Rev. Dupin decided America should do better for its aging population. He founded a company, N2Care, and, working with Virginia Tech Research Center in Blacksburg, VA, designed the MEDCottage, now known as the granny pod. Though several versions now exist, the basic MEDCottage is about 12 by 24 feet, or the size of a master bedroom, has vinyl siding, double French doors (to accommodate a wheelchair and hospital equipment) and looks like a small bungalow. Inside, it resembles a hotel suite, with living space, small kitchen and bathroom. Though the initial cost may seem steep, proponents point out that nursing home care is also expensive, costing upwards of $50,000 a year for a semi-private room, depending on location, and the company will buy back the units when no longer needed. Granny pods and other auxiliary dwelling units, or ADUs, offer a blend of independence and 24/7 caregiving, plus closeness to family and friends instead of isolation in a distant nursing home. More practically, these modular medical care units may be essential to providing care for the soaring numbers of seniors, a number the Census Bureau predicts will more than double from 35 million in 2000 to more than 70 million by 2030. Since Genworth, a firm specializing in long-term care and life insurance, predicts that at least 70 percent of the nation’s elderly will require long-term care at some time in their lives, the nation’s current 15,700 long-term care facilities may not be sufficient to meet the need. Something more is needed and these self-contained medical units could meet that need. 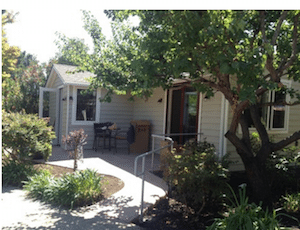 The MEDCottage, the original granny pod, may have received the most publicity, but as the auxiliary care unit idea has caught on, others have entered the field. Among the other versions are ASAPs, or Architectural Solutions for Aging Populations, developed by an architectural firm in San Francisco. Fab Cab in Seattle also has a pre-fabricated version, as do PALS (Practical Assisted Living Solutions) in Rockfall, Conn., and ECHOAs or Elderly Cottage Housing Opportunity Additions. Larson Shores, an architecture firm in the San Francisco Bay Area, provides pre-designed in-law cottages that are accessible, affordable, and sustainable, and built on the owner’s property. Yet the prefabricated units still encounter some opposition, especially from potential neighbors who worry about overcrowding, and warn that adding seniors and disabled residents will change the character of a neighborhood, increase traffic, and affect property values. Too, some people simply don’t like the idea of “warehousing” the elderly in a self-contained unit, even one that is close to family and friends. At accessorydwellings.org, which I co-edit, we’ve got dozens of stories of people aging in place in accessory dwelling units (ADUs), which is what governments tend to call buildings like these. First, if the thing is going to be installed on a foundation and hooked up to local utilities, the local government will probably insist that the building follow the local government’s standards for design, placement, build quality, etc. The prefab thing may have to be altered to meet those standards. Prefab can be just as expensive as conventionally built. 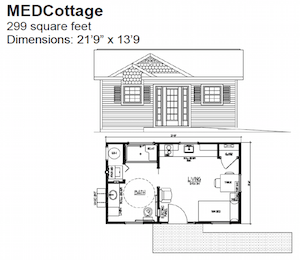 Once you start paying upward of $100K for a backyard cottage, you start wondering why it can’t be built with the custom touches you desire… a window here, a larger kitchen there, etc. We have an adult son who had disabilities. This would be a great idea for him to have somewhere safe to live more independently . For the right situation, this could be a great alternative. The two big challenges I see are cost and what happens after “granny” passes on. $125,000+ is a big investment for most people, and I can see these easily being repurposed as non-senior guest quarters or rental units. A better solution might be leasing the units, so there’s less of a reason to keep ’em, plus it would make them more affordable, much like other durable medical equipment. I think this is a fantastic idea, like a mother-in-law apartment. 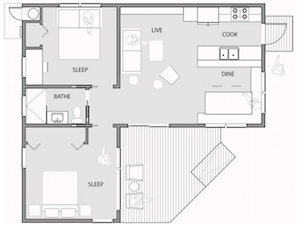 I do think that it needs to be just a bit larger and more like a regular 1 bedroom apartment, not a studio. I think they should only have the specialized equipment that is needed for that particular patient, not necessarily everything that is listed in the article. Some of the equipment should be optional. This is a great idea and much better alternative than nursing homes, where there is never enough staff to support the number of patients, and no guarantee the elderly will get the quality care they need and deserve. My Mother would have enjoyed such a unit on our property instead of living in the house with us. She had lived alone for 35 years, liked her alone time, and felt as though she had lost all her independence once she came to live with me. Done right, these units can be an asset to property values, and a financial life-saver for the elderly and their families.